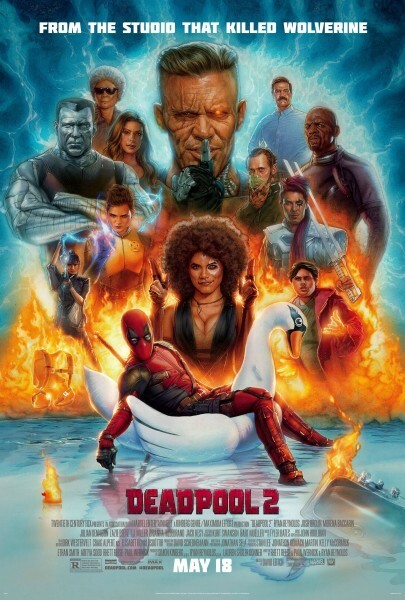 20th Century Fox is having a lot of fun with their Deadpool 2 campaign, and while they may be reluctant to take shots at Disney, they have no problem making fun of themselves. The latest poster features most of the cast and a tagline that calls them out for the ending of Logan. The image features the X-Force squad, Josh Brolin as Cable, and even a flaming kitchen sink suggesting the sequel will throw everything it's got out there. But there is one notable face missing. Pretty much everybody is there, including minor characters like Lewis Tan as Shatterstar and Rob Delaney as comic relief Peter W. Who you don't see is TJ Miller, with Fox probably guessing it's better to leave off the guy who has been such a public embarrassment lately. Doubtful he comes back for Deadpool 3, or X-Force or whatever the next movie is. Deadpool 2 opens May 18th.